Explore high quality custom lamination services for your application. Contact Frank Lowe for custom lamination consultation. Frank Lowe offers custom lamination services to supplement our custom fabrication services and die cutting. Our heat-assisted, temperature controlled laminators allow us to effectively combine several adhesives, substrates, and films together permanently. From heat-assisted substrates to double-coated and transfer adhesives, we offer laminating services that create a lasting, complete, and even bond throughout. Our laminators are enhanced by a computerized process to provide precise heat transfers to our materials. This additional step helps to ensure one of the most consistent bonds available. We also offer several laminating processes to quickly and efficiently deliver quality products. We'll work closely with you and always guide you to the most effective method of lamination based on the material, application need, and budget. Our custom lamination services are the ideal solution when you're to maintain the integrity of your product. We can apply pressure sensitive adhesives to a variety of materials, including felt, textiles, rubbers, plastics, and foams. 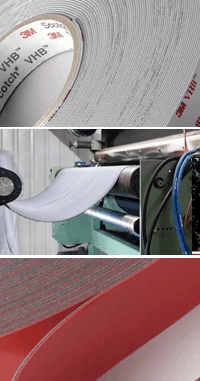 We use state-of-the-art equipment and have the capability to laminate materials in varying consistencies and thicknesses — regardless of the material used. Frank Lowe's custom lamination services allow us to provide comprehensive, end-to-end solutions for our customers. In most instances, our lamination service is combined with die cutting, which makes us your one-source for all of your custom manufacturing needs. Explore the benefits of different adhesive lamination techniques and materials. Pursue the most viable and beneficial options through comprehensive cost-benefit analysis. Create the best laminate to help extend the life of your product while remaining within budget. Whether you're just getting started or have been in business as long as we have, it's never too late or early to partner with Frank Lowe. Let's talk. We're ready to listen. Contact Frank Lowe today to learn more about our custom lamination services. Not sure about the exact materials or specs required for your lamination application? Let's chat. We'll help you find the right solution. Do You Need a Custom Lamination Solution For Your Product? Let's talk. We'll help you find the right lamination solution for your product.